CLUBBY V BEANIE BABY & Buddy NOW!!!! This BBOC(Beanie Baby Official Club) CLUBBY V Beanie Baby & Buddy were only available on the Internet & will never be sold in stores. 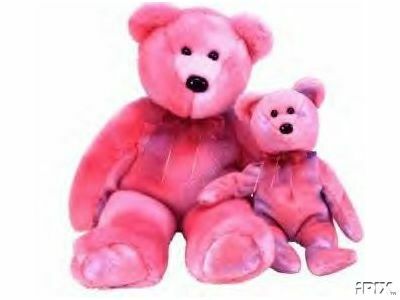 Beautiful teddy bears made from ty-dyed Tylon fabric in pretty shades of pink and lavendar. Has ty-dyed pink and lavendar neck ribbon. Sooo cuddly soft!!! ... They are mint, with mint tags, tag protected & from a smoke free environment. Sold separately also. Items Similar To "ty CLUBBY V BEANIE BABY & BUDDY 5TH ANNIVERSARY"